We are developing a new approach that parallels our computational study. Diverse experiments in cochlear research are can be grouped into three categories: experiments with live animals, isolated tissues and individual hair cells. In vivo experiments preserve such natural conditions, but have poor accessibility to the sensory epithelium and few means of control. The cochlea. 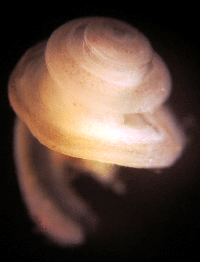 A cochlear coil was isolated from young gerbil. (Daniel Marnell, BME PhD student). The in vitroexperiment has full access to its interested cells and tissues, but unique physiological conditions of the cochlear partition are greatly compromised. A novel experimental approach overcoming the limitations of existing experiments may help to settle the current debate on the organ of Corti mechanics. 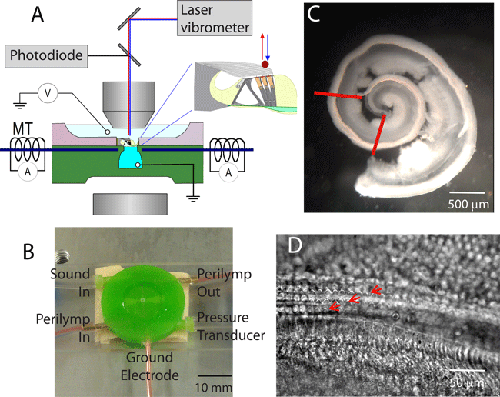 We develop a micro-chamber system that imitates the function of the cochlea so that it can provide controlled physiological conditions to an isolated cochlear partition. With this new micro-chamber system, we aim to address the pivotal question in cochlear research: how outer hair cells, the cochlear amplifier, work within the OC. In vitro measurement of mechano-transduction in the organ of Corti. (A) Experimental system. The µ-chamber is placed under objective lens. Mechanical stimulation is applied either by hydraulic pressure at the bottom chamber or by the magnetic force (MT). Vibrations are measured by laser vibrometer and photodiodes. Trans-membrance current is measured using a voltage clamp system (V) (B) The µ-chamber has five ports: 2 for solution circulation, 2 for sound input and output and one for electrode. (C) A cochlear epithelium isolated from a young rat (7 day old). The section between red lines is cut and implanted to the µ-chamber. (D) Sensory epithelium under light microscope. Three rows of OHCs are marked with red arrows.